What is this Zombie Apocalypse? The Zombie Apocalypse is the breakdown of society as a result of an initial zombie outbreak that spreads. It is a widespread rise of zombies that are hostile to human life. They engages in a general assault on our civilization. Those that become victims of zombies may become zombies themselves. The reason for this is the zombie virus plague that infects people that come into contact with it. As the zombie virus spreads it will lead to the collapse of society until only a few isolated pockets of survivors are left. These people will be scavenging for food and supplies because the world will be reduced to a pre-industrial hostile wilderness. The zombie apocalypse signals the end of the world as we known it today. The one thing these people will want is a zombie apocalypse food kit. There will be little let to eat and no time to grow more food. A food kit will be just the ticket to elude these devilish undead. The reason that the zombie apocalypse is for dangerous is that the initial contacts with zombies are extremely traumatic. They cause shock, panic, disbelief, and possibly denial. All this combined is what hampers survivors' ability to handle the hostile encounters with zombies. The Centers for Disease Control and Prevention published a graphic novel titled "Preparedness 101: Zombie Apocalypse" which provides tips to survive a zombie invasion. The real intent of corse is to create a fun new way to teach the importance of emergency preparedness. All joking aside, it is important to remember that real disasters are far more scary than any Zombie Apocalypse that may or may not happen. You really need to think about your future and how you are preparing today to meet the challenges that are a head of us as a nation. Natural disasters are no laughing matter. If you notice, the graph below clearly shows that natural disasters are increasing at a dramatic rate. This is not the same world your grand parents grew up in. They knew how to survival hard times. Do you? The best way to prepare of the future is to buy a good supply of food storage and water. 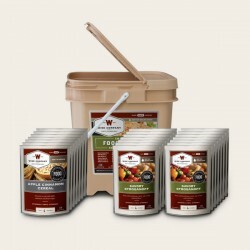 Check out our Four Week Breakfast & Entrées Food Storage bucket. 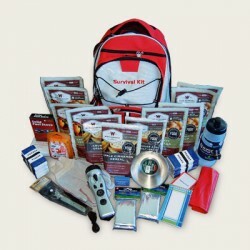 This kit includes everything an adult will need in an preparedness kit: food, light, cooking equipment, tools, and vital first aid!